NanoSight’s “Nanoparticle Tracking Analysis” (NTA) detects and visualizes populations of nanoparticles in liquids down to 10 nm, dependent on material, and measures the size of each particle from direct observations of diffusion. Additionally, NanoSight measures concentration and a fluorescence mode differentiates suitably-labelled particles within complex background suspensions. Zeta potential measurements are similarly particle-specific. It is this particle-by-particle methodology that takes NTA beyond traditional light scattering and other ensemble techniques in providing high-resolution particle size distributions and validates data with information-rich video files of the particles moving under Brownian motion. NanoSight has installed more than 500 systems worldwide with users including BASF, GlaxoSmithKline, Merck, Novartis, Pfizer, Proctor and Gamble, Roche and Unilever together with the most eminent universities and research institutes. NanoSight’s technology is validated by 600+ third party papers citing NanoSight results. NanoSight’s leadership position in nanoparticle characterization is consolidated further with publication of an ASTM International standard, ASTM E2834, which describes the NTA methodology for detection and analysis of nanoparticles. NanoSight reports on how Nanoparticle Tracking Analysis, NTA, is being used to study extracellular vesicles in the research laboratories of Dr Gregory Gores of the Mayo Clinic in Rochester, Minnesota. NanoSight reports on how the University of Cordoba has applied Nanoparticle Tracking Analysis, NTA, to improve the understanding of the behaviour of silver colloids used in the development of sustainable nanomaterials. Silicone oil is commonly used as a lubricant coating in prefilled syringes (PFS) and is becoming one of the most highly discussed topics in the PFS market, particularly for developers of highly sensitive biotech drugs. NanoSight reports on how Nanoparticle Tracking Analysis, NTA, is being used at French company, Santen SAS, to use different nanoemulsions for applications in the treatment of the human eye. NanoSight reports on how Nanoparticle Tracking Analysis, NTA, is being used in the Faculty of Chemistry of the Jagiellonian University for the characterization of catalytic materials used in environmental applications such as N2O decomposition and soot oxidation. NanoSight reports on how Nanoparticle Tracking Analysis, NTA, is being used at St George's, University of London, to explore extracellular vesicles as a potential source of biomarkers, by identifying proteins or peptides differentially expressed between healthy subjects and patients with rare inherited diseases. NanoSight, world-leading providers of unique nanoparticle characterization technology, announces that more than 800 third party publications citing their Nanoparticle Tracking Analysis (NTA) methodology have been published, and reflect on the significance of this powerful third party endorsement. NanoSight announces the release of a new NS500 instrument with a Dynamic Light Scattering (DLS) module, which will take the lower size limit of detection down to around 4 nm in diameter. NanoSight reports on how Nanoparticle Tracking Analysis, NTA, is being used at the University of Wyoming in the characterization of the physical and interfacial properties of manufactured nano materials. NanoSight reports on how Nanoparticle Tracking Analysis, NTA, is being applied in the Chemical Engineering Department of the California Institute of Technology to study nanoparticle-based therapeutics being developed for the treatment of illnesses such as dementia and Alzheimer's. NanoSight reports on how Nanoparticle Tracking Analysis, NTA, is being implemented for the further characterization of natural colloids (inorganic and organic) at the Institute of Water Resources and Water Supply at the Technical University Hamburg-Harburg in Germany. 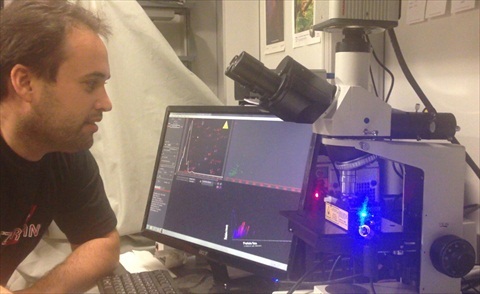 NanoSight reports on how Nanoparticle Tracking Analysis, NTA, is being used in the research project "Engineering of Biomolecules" at the Lorraine University, based in Nancy. NanoSight announces that Particle Technology Labs, PTL, has established cGMP compliance for Nanoparticle Tracking Analysis, NTA, and this is now available on a contract basis to the pharmaceutical industry. FREE NanoSight Webinar on the use of Nanoparticle Tracking Analysis in Drug Delivery Research. NanoSight reports on how Nanoparticle Tracking Analysis, NTA, is being used in the development of a method to estimate the purity of vesicle preparations by comparing the ratio of nano-vesicle counts to protein concentration. This work is reported by Dr Aled Clayton of the School of Medicine at Cardiff University in an original research article published in the Journal of Extracellular Vesicles. The Science and Engineering Institutes, Singapore, are using Nanoparticle Tracking Analysis to characterize exosomes. Jul 9, 2012 NanoSight, leading manufacturers of unique nanoparticle characterization technology, reports on the work of Dr Seow Yiqi at SCEI, Singapore where they apply Nanoparticle Tracking Analysis (NTA) to characterize exosomes for use in delivering therapeutic moieties to specific tissues in vivo. The Molecular Engineering Laboratory was established in 2009 by Nobel Laureate Dr Sydney Brenner as a multi-disciplinary laboratory where diverse expertise from different realms of science could come together to develop novel technologies. Post-doctoral fellows in the laboratory undertake a wide variety of research ranging from organic fluorophore development to characterization of marine biomaterials with unique physical properties to genetic therapies. Leading UK scientist, Dr Andrew Shuttleworth, joins NanoSight board as Director of Diagnostic Sciences Jul 2, 2012 NanoSight, leading manufacturers of unique nanoparticle characterization technology, announces the appointment of renowned UK scientist and former government advisor, Dr Andrew Shuttleworth, as Director of Diagnostic Sciences. NanoSight wins Technology World's 2011 Business Innovation Award Dec 8, 2011 NanoSight, leading manufacturers of unique nanoparticle characterization technology, are winners of this year's Technology World's 2011 Business Innovation Award in the category of Energy & Environment. These annual awards are sponsored by the PA Consulting Group. The National Physical Laboratory uses NanoSight NTA system for nanoparticle characterization Mar 15, 2011 NanoSight, world-leading manufacturers of unique nanoparticle characterization technology announce that the UK's National Physical Laboratory uses the LM-10 system for their studies in nanoparticle characterization. The National Physical Laboratory routinely looks at emerging techniques to evaluate their performance for the quantitative characterization of nanomaterials. King Abdullah University for Science & Technology uses NanoSight Characterization System to Aid their Water Desalination & Reuse Research Programs Nov 5, 2010 Installation and training of a NanoSight LM20 nanoparticle characterization system has been completed at the prestigious King Abdullah University of Science and Technology located 80km north of Saudi Arabia’s second largest city, Jeddah. Johns Hopkins University uses NanoSight to study self-assembled polymer/DNA particles Oct 31, 2010 The Department of Biomedical Engineering, Johns Hopkins University School of Medicine is using the NanoSight LM10-HS system to study self-assembled polymer/DNA particles for drug delivery. Conference highlights Biomarker Detection Role for NanoSight Oct 7, 2010 Researchers from Oxford have recently presented exciting new data applying nanoparticle tracking analysis (NTA) to size and count both cellular microvesicles and exosomes at a low concentration and, when used in conjunction with fluorescent labels, to selectively determine and analyse specific types of vesicle within a complex sample. Coriolis PharmaService chooses NanoSight to study the aggregation of protein drugs and vaccines Sep 10, 2010 Munich-based company Coriolis PharmaServices GmbH is using NanoSight’s LM-20 nanoparticle characterization system to investigate the aggregation behaviour of protein drugs and vaccines. The Forschungszentrum Dresden-Rossendorf chooses NanoSight to characterize magnetic nanoparticles Aug 13, 2010 The Institute for Radiopharmacy at the Forschungszentrum Dresden-Rossendorf is using NanoSight’s LM-20 nanoparticle characterization system to study magnetic nanoparticles for applications in cancer therapy. NanoSight holds first European users meeting on nanoparticle characterization in Langen, Germany Jul 14, 2010 NanoSight, world-leading manufacturers of unique nanoparticle characterization technology, together with distributor partners Schaefer Technologie, have recently held a meeting of users of their successful range of nanoparticle tracking analysis instruments in Langen, Germany. University of Leicester uses NanoSight to characterize marine viruses & bacteriophages Jun 9, 2010 The Department of Infection, Immunity and Inflammation at the University of Leicester is using the NanoSight nanoparticle characterization system to count bacteriophage and marine viruses. NanoSight reports 100th third party peer reviewed paper is published; NTA is now firmly established worldwide May 25, 2010 NanoSight, world-leading manufacturers of unique nanoparticle characterization technology, announces that more than 100 third party publications citing the use of their nanoparticle tracking analysis (NTA) technology are now available in print. Nanosight announces interactive webinar on May 19th entitled Nanoparticle Tracking Analysis – complementing DLS for More Complex Dispersions May 7, 2010 NanoSight, world-leading manufacturer of unique nanoparticle characterization technology, announces an interactive webinar on Wednesday 19th May, 0700 PDT, 1000 EST, 1500 BST, then again live, two hours later at 0900 PDT, 1200 EST, 1700 BST. Introducing the new NS500 system from NanoSight Ltd. Apr 26, 2010 NanoSight, manufacturers of unique nanoparticle characterization technology, announce their new NS500 system incorporating new hardware and software to deliver NanoSight's growing capability in particle-by-particle characterization in an automated package. Leiden University uses NanoSight Characterization System to Aid Their Drug Delivery Research Programs Feb 23, 2010 The Division of Drug Delivery Technology is part of the Leiden/Amsterdam Center for Drug Research (LACDR), a research institute located at the Gorlaeus laboratories in Leiden in the Netherlands. The group focuses primarily on vaccine delivery and on protein formulation and characterization with respect to immunogenicity. NanoSight announces a new generation nanoparticle characterisation system – The NanoSight NS500 Feb 3, 2010 NanoSight, manufacturers of unique nanoparticle characterisation technology, announces the release of the NS500 system. The NS500 incorporates new hardware and software to deliver NanoSight's growing capability in particle-by-particle characterisation in an automated package. Georgia Institute of Technology selects Nanosight to study the size of nanogels used in developing drug delivery vehicles Jan 13, 2010 The School of Chemistry & Biochemistry at Georgia Institute of Technology has chosen the NanoSight LM-20 system to help in the characterisation of dimensional changes of nanogels used in the development of drug delivery vehicles for macromolecular therapeutics. NanoSight short-listed in 2009 Business Innovation Awards at the UK NanoForum recognising their contribution to nanometrology Dec 9, 2009 NanoSight, providers of unique nanoparticle characterisation technology, attended the fourth annual UK NanoForum & Emerging Technologies conference and exhibition which brought together over 100 senior international delegates and 350 UK delegates to network and identify potential business and collaboration opportunities in the world of nanotechnology.